In addition, the designed Class will allow you to unsubscribe any of the previously registered objects, either to stop receiving notifications by the observed object at all, or just some of the previously registered notifications. 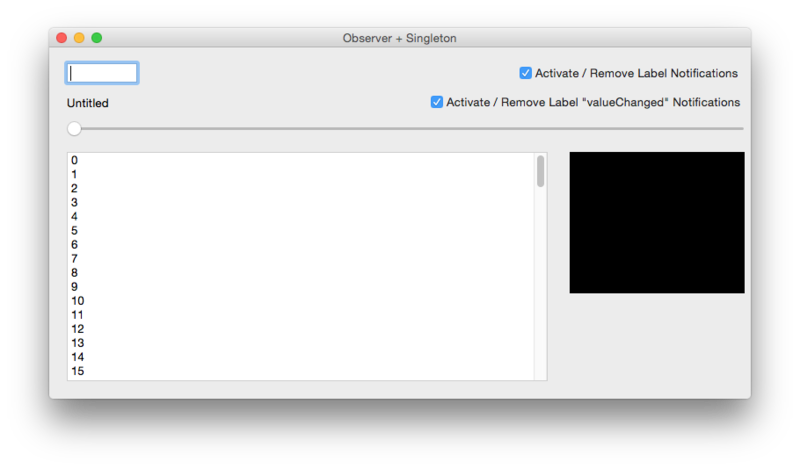 The Singleton and Observer Design Patterns have been described in previous blog entries and I highly recommend to read them now so you can get the flavor of the fundamentals behind them. I’ll wait here for you, I promise! Then we will deal with the code that varies to implement our NotificationCenter class, and to put it in practice with a Desktop example project. Of course, before of continuing reading, you can download the example project, run it and review the code to get a first glance of what it does and how it works. Then, you can come back and continue reading if you want to better understand the NotificationCenter class inner, or how other objects can use this class. Execute the Xojo IDE and create a new Desktop project. Add a new class using Insert > Class. Go to the Inspector and change the Name attribute to “NotificationCenter”. This is the name of the new class we are designing (and, thus, a new Data Type). Next, add a new Method (Insert > Method). Use the Inspector to choose the Constructor option from the “Method Name” dropdown menu, and set the method Scope to Private. Defining the Constructor method with a Private scope prohibits the creation of several instances from the class. Instead of that, the class consumers will have to use the convenience method defined by us in order to retrieve the same —and unique— instance for all the cases. That is, the “Observers” Xojo.Core.Dictionary Property uses as Key any object of RectControl data type (the observed object). The associated value for that key is a new Xojo.Core.Dictionary, whose entries will use as Key the Notification (message as Text data type) for what an object wants to register as observer for such Control. This way, one same object can be registered to several controls and also to several messages (Notifications) on one or several controls. Finally, the associated value for every Key on this second Xojo.Core.Dictionary is an Array data type whose items are instances of the NotificationReceiver data type. I know, I know… Stop. Breathe. Execute again the example project. Review the code on the “Register” method to get a better grasp… and back to follow! 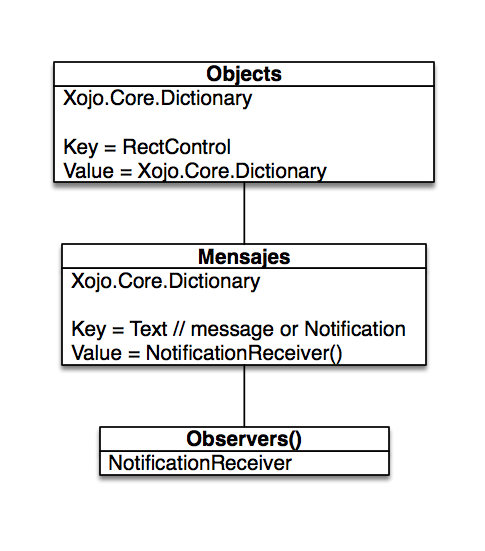 As you can see in “Parameters”, the first parameter is the Observer object (this is the interesed object in receiving the notifications); the second parameter is the observed object (that is from which we want to receive notifications); and the third parameter is the message from which we are interested in receiving the notifications by the observed object. As you can see, the first parameter of the method is the control that wants to send a notification (second parameter) to all the possible registered objects, passing the value that such objects can be interested to receive for processing it (third parameter). Along the implementation of our Notification Center class we have seen several times the reference to the NotificationReceiver data type. This is what we are going to get our hands on next. In fact this is a Class Interface; what means that it works as a “glue” in order that any object can implement their defined methods. This way the objects can be seen as their native class and also as an instance from NotificationReceiver, so they can be registered as observers on the Notification Center independently the native class they are based on. Done! Depending on your own needs, you can add more methods for the interface class in combination with the Notification Center class itself. Now it is time to design the user interface in order to test the Notification Center class. The changes made on a TextField control will automatically update the contents of a Label control, a Slider control, a ListBox control and a Canvas control. Moreover, the Label instance will subscribe in the Notification Center to receive two types of notifications, changing his behaviour (the text shown) based on the received notification. We will also add a couple of CheckBox controls to test the functionality to unsuscribe the Label control from all or just some notifications. But before we start with that, and as we have seen in the previous step, we need that all the objects that want to be able to register on the Notification Center be of the NotificationReceiver data type. That means that we need to create our own subclases for the Label, Slider, ListBox and Canvas controles. Let’s start with the Label! Create a new sublcass for the Label Class. You can do that selecting the Label control from the Library and choosing the “New Subclass” option from the contextual menu; or you can drag and drop the control from the Library to the Navigator. Anyway, the result will be the same: you will have created a new subclass with the name “CustomLabel” (it can vary, depending the Xojo release you use). By the way, you also can use Insert > Class in order to create a new subclass. Super: Label // This way, our sublcass will inherit all the methods, events and properties from the base class. Interfaces: Click on the button and choose “NotificationReceived” from the resulting panel/Window. Confirm the selection clicking on the “OK” button. Here we raise a new event (not defined yet), so every instance from the class can be in charge of implement the real behavior in base of the parameters received. Interfaces: Add the NotificationReceiver Class Interface as seen in the previous step. Once we have created the subclasses for the Controls we will use as observers in our example app, it is time to design the user interface. For that, choose the window by default for the project (Window1). Xojo will show the Layout Designer for the selected Window. Drag the subclass controls from the Navigator (or from the Library) so they are arranged as shown in this picture. In addition, drag a couple of CheckBox controls and one TextField too from the Library to the layout. As you can see, the event uses the received message to decide how to work with the value sent by the observed object. In one case it will show the value as is, and for the other it will show the ASCII code for the value received as Text. In this case, the control will simply assign to his “value” property the value received. For both cases, we retrieve the shared instance from the Notification Center class and publish a new notification, passing along the own control as first argument (acting as originator), the message or published notification as second argument, and the value sent as the third argument. From this point on, the Notification Center will be in charge of propagate the received notification to all the interested objects. Let’s get in charge of the user interface controls whose function is to enable and disable the notifications for our MyLabel instance (Label1). As you can see, in the first block of code we register the “Label2” control so it can receive both notifications when the checkbox value is True, and unsubscribe the control from receiving any notification when the checkbox is False. For the second block of code, the “Label2” control just subscribe or unsubscribe for one of the two notifications, respectively. What we need to put all to work? Add the Open event handler to “Window1” and write the following code. This code will register the interested controls (observers) to the Notification Center for those Notifications they are interested in. Of course, this can also be done inside the Open event handler for every interested control! As we have seen, with the combination of the Observer and Singleton Design Patterns, and the help of one Class Interface definition, we have created our own Notification Center from scratch to greatly automatice and simplify the communication between the objects, their processes and easying also the maintenance and extension of the app functionallity. Previous Post Is Microsoft bringing Visual Studio to the Mac?